This is what Borges would have been like as a maximalist—which is to say, instead of an eight-page story of commentary upon a sixteenth-century book of questionable attribution that posits the discovery of the New World as being both non-existent and a conspiracy, he would have written the entirety of the treatise in its period-correct (though with enough errant mistakes to make one occasionally question it) baroque and straight-faced style, appended it with commentary, and published it as a "found-text." 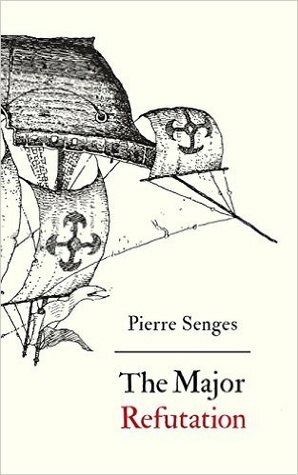 Senges, like Borges, can turn, seemingly on a dime, between disorienting erudition and striking emotional valency. He works to open up the world to the realm of fantastic possibility and speculation—even as an American reading this book refuting the land I sit on, it felt like a poetic move, a sci-fi move, especially as it is interpolated through the lens of Senges writing a sixteenth-century text in the twenty-first. There is no unified conspiracy of why the New World was created as a fake discovery, rather as an idea it is considered (as the table of contents puts it) "an opportune object, convenient to all." The competing conspiracy theories contradict, erase, and unify one another, just at the academic appendix creates cross-purposed authorship, even considering the harsh jabs at Amerigo Vespucci within the text as potential proof of his role as its producer. I dread those beings living in the harmony of review and synthesis, because in their profound understanding there resides a profoundly carceral instinct. [...] I curse those on whom nothing is lost and who, once they have turned a book's last page, are convinced they have done all that there was to do, & rejoice in that tautology, as they might at the fulfillment of a duty.